When we last left our Her-oes it was revealed that Jen has serious anger issues, that Namora never backs down from a fight, and that everyone has not been completely honest with Janet about what has been going on around her. Janet is given little time to sort all of this out before her world expands further into Marvel lore when she, along with Namora and Jen, are forcibly returned to her father’s lab by Miss America. Miss America explains that she is part of a secret military unit that has been secretly gathering meta-humans in Cresskill, where they are forbidden to use their powers publicly to maintain national security. 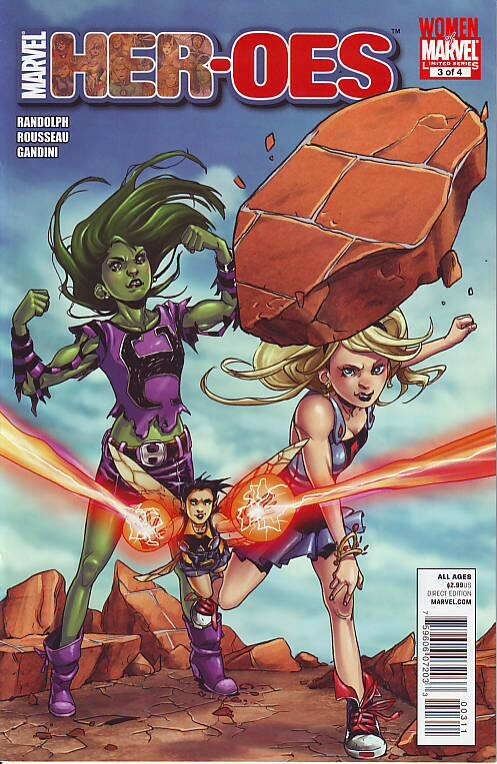 Fearful that Jen would be locked away forever because she cannot fully control her powers, Janet and Namora break out her of the lab in a meta-powered bid for freedom. Hoping Namora’s visiting cousin can help them, they drive to her house but find him gone for the weekend. Before the girls can plan their next move, they are visited by Moonstone, who has been tracking Jen’s gamma radiation trail. Fleeing upstairs after Moonstone demonstrates her phasing ability with a closed door, the girls are faced with a demand to surrender Jen. They quickly realise that Moonstone and her two male cohorts (who share her fashion affinity for gold) are unaware that Janet and Namora have special powers. Unwilling to let her friends reveal themselves to protect her, Jen selflessly hulks out to combat the villainous trio alone (click to enlarge). Refusing to allow Jen to fight solo, Janet and Namora quickly fabricate ad hoc costumes with designer scarves and Mardi Gras masks to protect their identities and dive into action as the issue ends. Eugene Liptak is a librarian and author who is currently working on a display to commemorate the 30th anniversary of She-Hulk at the Pima County Public Library in Tucson, Arizona.